This high-quality product is made by a leading manufacturer to replace the humidifier filter (AKA water panel, water pad, evaporator pad) in many makes and models of whole house humidifiers. This product is found in the large bypass "water saver" or drainless humidifiers manufactured by Aprilaire, Bryant, Carrier, Totaline and others. Warm, dry air is forced through the wet panel to introduce water vapor into the home. 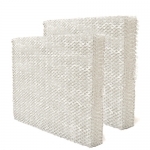 This filter is constructed of a reinforced paper material instead of aluminum to allow for proper operation in drainless humidifiers. It should be changed at least two times per heating season. High quality, low-cost alternative to factory original product. Made in USA of high-quality components. Guaranteed to fit your whole house humidifier. Size: 10" X 13" X 1-1/2"